It’s rush hour on a hot day. You’re in the left lane trying to pass traffic, but that car ahead of you doesn’t seem to have the same agenda. Maybe scooching in a little closer will get your point across. It’s just a few inches. What’s the worst that could happen? The worst is that you can cause an accident, of course. According to the Texas Department of Insurance, rear-end collisions are 23 percent of all accidents, causing nearly 2,000 deaths and 950,000 injuries. Keep calm. Some drivers mentally prepare themselves for tailgating or other annoying drivers. Adding your own unfriendly gestures will likely not help things. Reassess the distance. Is your definition of “close” too liberal? Sometimes the other driver realizes he’s too close and backs off. Give the situation a minute or two, and make sure you’re being fair. Move over. 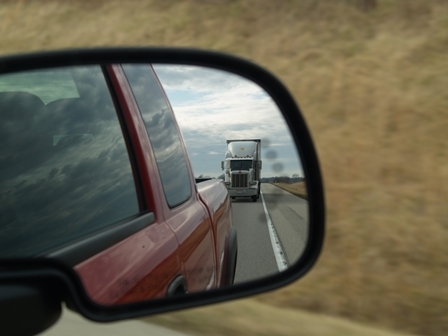 If at all possible, get out of the same lane as the tailgater, allowing that driver to pass you. If you’re on city streets, consider turning off if the other driver is really infuriating. Don’t make things worse. Stepping on your brakes until you slow down, or driving at irregular speeds will not resolve the issue. Remember that it’s almost always illegal to cause an accident by driving into the back of the car in front of you. And for drivers inclined to follow too close, remember staying a safe distance saves lives. Increase that distance in poor driving conditions.